I made something like this once. 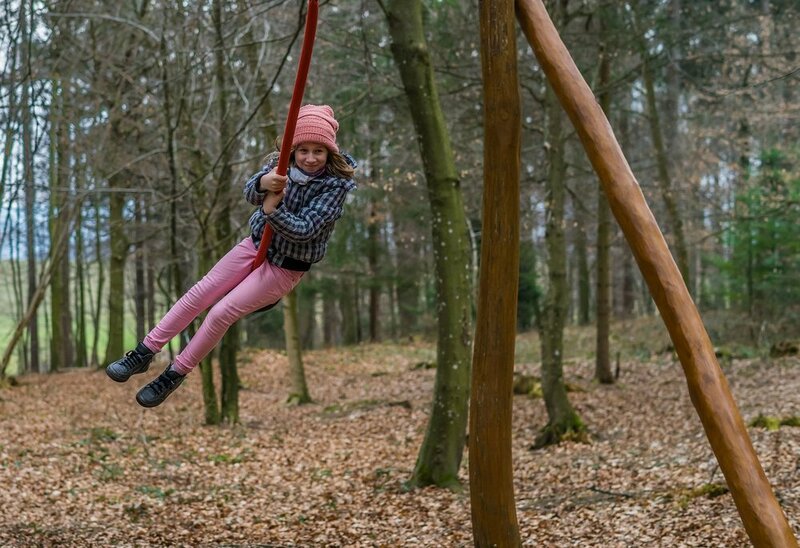 After reading this story in one of my favorite magazines, The Atlantic, about the "adventure playgrounds" in Wales that are lightly supervised and vastly different than today's typical American playground, I got introspective about today's helicopter parenting and play in general. Popular in the 1940s in the U.K. (where and when my late father grew up), these adventure playgrounds bypassed slides and swings (useful skill?) for a "free and permissive atmosphere" with as little adult supervision as possible - in tune with the cultural expectations of a society who expected post-wartime kids to grow up with a little risk, danger and autonomy, and more self-confidence and courage. Can you imagine a neighborhood space today filled with old tires, discarded items and even things you could light on fire? I can. When I was about eight growing up in the 1970s Boston suburbs in a house much like all the other neighbor's houses, my hardworking mom joined the ranks of working women and got a full-time job in Boston. With this major life shift, I also gained a job title: latchkey kid. (I literally hung the house key to our house around my neck with yarn.) After school, my friends and I would play outside, unsupervised, doing whatever came to mind that day, decided by kid democracy. We'd make stick forts, create board games, explore "creepy" houses and abandoned fields, ride bikes around fences with "do not trespass" signs and find cool objects and take them home in my basket. Found stuff got tied with yarn to other stuff, making bigger, more awesome stuff. Signs would be made to not touch stuff - and mostly, kids respected the signs. If I ever got hurt, I healed fast. As a small business owner and parent, I better understand how that experience helped me learn the value of taking risks and receiving rewards, troubleshooting problems, getting lost and finding my way, and learning to ask a local mom for help or a bathroom or a drink of water. In exchange for my freedom, I made sure I was responsible enough to kept track of time and got home before the streetlights went on to start homework and help with dinner, or there'd be yelling and grounding. I learned consequences: I knew to put my bike away or it would get stolen, how to wash off dirt and grime of whatever I'd been "into" that day or I might get an infection, and if the day's creation broke, I reflected over dinner how to fix it and make an even more awesome swing/fort/jail/pirate thingy the next day. This latchkey kid went on to foster an interest in models, then theater set design, and then to the paper arts of art/typography/graphic design, which led to a degree in advertising; now I build campaigns with words and relationships as a public relations professional... work that I still consider adventurous and playful most of the time. It's no secret that many overprotected, bubble-wrapped kids grapple with anxiety, depression and low self-esteem. I'm not implying that all kids are overprotected, or that an adventure playground will "cure" things like ADD/ADHD, autism or clinical depression, but perhaps we need to look at what tools we as "helicopter parents" are giving our children - and our greater society - to foster a sense of independence and self-reliance. How do kids today ever learn the art and science of taking risks and troubleshooting, and being curious and clever in a free environment? How can we help the next generation embrace the joy of discovery in an unfamiliar circumstance - more adventurous play? Would more skate parks and adventure playgrounds and less supervised activities and homework really help make more independent, happier, more self-reliant and confident kids? Kids who are physically active get better grades... are they more curious and clever? And for fellow fans of architecture and design, check out this blog and Pinterest board on playful and artfully designed spaces, and this New York Times story on preschools without walls - where the adventure begins.